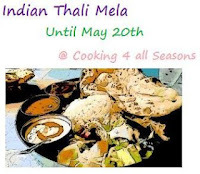 I have already written about the Gujrati cuisine yesterday.Today I shall write about another Gujrati thaali.This is a seasonal Thaali which can be relished in summers when the Mangoes are in full swing. This is a personal favorite of mine .The mango curry is unique ,its got that mango flavor which is very very pleasant ,a little sweet with just the right heat of chilly.Tempered with pure ghee and curry leaves its aroma is mind blowing.This is absolutely light food just right for summers when one hates to work for long hours in the kitchen.Also light on the stomach due to mild spices . Add tindodoas salt and turmeric.Saute’. Add ¼ cup water and cover the pan. Cook on slow fire till done,stirring once or twice in between . If the water dries up add some if the tindodas are not cooked. Add the rest of the spices and cook for 3-4 minutes on slow fire till the masalas are absorbed. Saute’ on full flame for a minute or two. Add all the spices and immediately add the drained daal. Add just enough water for the daal to cook. Cook on full flame for one boil then simmer. Make sure the each grain of the daal is seperate. Do not stir ,if at all you do be gentle. Cook without covering till the water is absorbed and the daal is cooked,if you feel the daal is not cooked and the water is over then add little water. The Gujjus always eat roti and shaak first and then complete their meal with daal bhaat..in this thaali they put the chutti moong daal on rice and pour the curry on top ,all these make up one combination and since the ras is sweet no other sweet is served. The ras is served chilled with ghee and sonth.The sonth is added to avoid gas.The farsan served here is Edada also known as safed dhokla.these dhoklas are dipped in ras and gujjus go ga ga over them ,though personally I have never tried and the idea does not appeal to me.To tell you a little about the ba’ pad ki roti.these are paper thin chapatis ,smeared in ghee. The accompaniments are cucumber salad made with musturd pwd.The pickle to go with this is Keri Gunda nu Aathanu..Keri being raw Mango and Gunda is Gum berry…which is available only for a short time in summers.The masala used for this is the famous Methia Masala. No drinks are served with this thaali ..Ras is relished as a sweet as well as a drink..This is so delicious that normally 2-3 katoris have to be served per person.Calories?…well …..The summer heat and chilled ras..you just dont think of anything and enjoy this lovely meal. I should not miss out on the Kheechu papad which is made of rice and the Mukwaas which is Dhanna ne daal. Traditionally the food is served in copper Thaalis ,with a betel leaf on which pickle is placed. The tindos were chopped , potatoes boiled ,one day in advance.The dhokla batter was made a day before and placed in the frig.The mango pulp was readymade since the right variety of mangoes have still not hit the market The whole meal was cooked in less than an hour. Special thanks to my dear friend Anaar who made these rotis for me and lended me this traditional thaali. Totally Speechless and absolutely drooling here! OMG !!! I am salivating here. It is lunch time and I so badly want that thali. You are tempting me to go to my favorite Gujarati restaurant "Rajdhani" where they do all you eat buffet (but with you nicely sitting on the table and them coming and serving whatever you need, cool right). Beautiful pics. so far this is my favorite thali..I would eat every last morsel from the dish…and the colors photograph so vibrant….my stomach is growling!!! I have no more words to praise your thaali …I need to reserve some for other bloggers too…as a matter of fact I don't know how to praise it, I'm at loss of words. Such a festive thaali, I can feast on it anytime. You are rocking girl….keep the momentum up!!! Never seen white doklas ,before..Beautiful thali platter. Another mouthwatering thali! Tindoda nu shaak looks delicious and crunchy. Love that Thali, the cups/bowl gives a authentic look!!! Mango Curry n Ras mm slurp!!!!! yummy!!! OOH ! Lady, you should compete in some international competition on Indian Thalis and am sure you would win hands down ! Edada again 🙂 🙂 mouthwaterng thali… and making me very very hungry !! Omg, i want badly this platter, wat an irresistible spread,drooling here..
totally in awe!! so vibrant and colorful the dishes are so well presented and each of them is tempting! The white dhokla is a favourite with us. Do you have the recipe on your blog? Thanks a ton …everyone..so so glad that u all are enjoying the thaalis..
@Jayashree the white dhoklas / Edada are on the blog.check out! !…and someone asked me how many pieces you would get from this recipe..from three cups you get about 4thaalis..and each thaali would have 20 pieces.Three people can eat from one dhokla thaali.Hope I am clear. Colorful spread! Loving all your thali posts. Wow!I am speechless.Such an exquisite platter.The next time we meet this is what I would like to have.Your description of the Mango curry is making me drool. No words to write after seeing a winderfyl spread. Awesome presentation and clicks. Awesome Vaishali. It looks yummy…Thanks for sharing….. The food is looking yummy and delicious. Do you prefer cooking food or online ordering food?